esProc is a pure Java product, with innate outstanding integration capablity. The software includes four parts: JDBC, Command line, Server, and IDE. JDBC is the calling interface specifically designed for applications to call esProc. The calling method through esProc JDBC is similar to that of calling the stored procedure of normal databases, i.e. JDBC URL\ ResultSet. esProc, as the data source for computing tasks involving complex or cross-database computations, or requiring high performance, can be directly integrated with reporting tools and Java applications. Most reporting tools support JDBC directly, such as BIRT, Crystal Report, and JasperReport, which can integrate esProc seamlessly without any further coding. Users can first prepare the data source with an esProc script, which will then be called via JDBC in the reporting tool. The result from esProc will involve in the report design as the standard stored procedure data source. In this way, the complex data source preparation for report is transferred to esProc, and the reporting tool can focus on presentation. 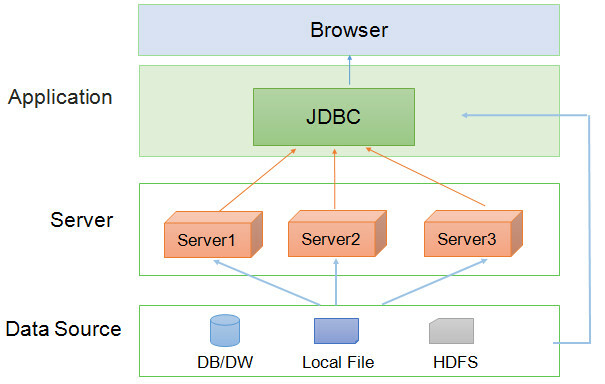 Similarly, with JDBC Driver users can integrate the result of esProc high performance computation or of the big data parallel computation with a reporting tool or JAVA code.